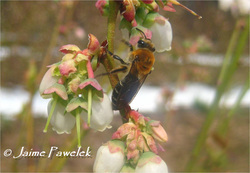 A Colletes female foraging on blueberry. The Colletids are one of the smaller families of bees in Florida comprising of about 35 species in 5 genera. In other parts of the world though, like South America and Australia, these bees are quite abundant and diverse. In Florida, most of the bees in this family are in the genus' Colletes and Hylaeus. Colletes are a medium sized bee, often looking like Andrena or Halictus, with heart-shaped faces. They also have an S-shaped curve near the edge of their wings that distinquish them from other bees. Most Colletes are ground nesters, though in other parts of the world they are known to nest in hollow pithy plant stems as well. The provisions (nectar and pollen) these bees leave in their nests is more liquid that other bees. During nesting they attach the eggs to the upper wall of the cell instead of directly on top of the provisions. They also make a cellophane-like membrane to seal off their nest and to separate cells with. Bees in the genus Hylaeus are very small (many are smaller than a grain of rice), relatively hairless, and are often confused with wasps. They are often referred to as yellow-faced bees because most have some yellow markings on the very front of their faces, although this is hard to tell because they are so tiny! These bees nest mostly in dead plant stems separating the cells of the nest with a cellophane-like material. They are also known to nest in old beetle holes or nail holes in wood. Since these bees have very few hairs they collect pollen and store it internally in their crop. Their nest provisions are also more liquid, like Colletes. Only a few species of Colletids were collected in the survey during 2011, but here are a few of the plants they were recorded on.